The big cocktail challenge for Saint Patrick's Day is creating a naturally green cocktail. Without using the artificially colored green liqueurs like green creme de menthe, Midori or apple puckers you have to think outside the box a little bit. So I went with what is naturally green in nature, green vegetables and fruits. Then I added booze! 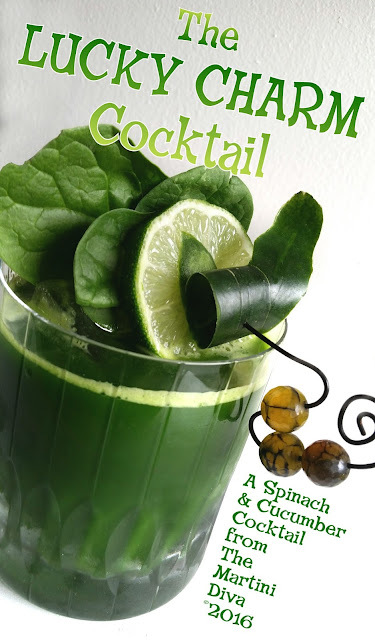 Not only is this cocktail green, it's refreshingly delicious and healthy! DIRECTIONS: Juice 5 ounces of spinach to get an ounce of spinach juice. Juice 1/2 a small unpeeled cucumber to get 4 ounces of cucumber juice. Prepare the Honey Créme Lavender Syrup by warming 1 heaping tablespoon of Honey Ridge Farms Honey Créme Lavender Syrup with 1 tablespoon of water for 15 to 20 seconds in the microwave, let cool. Fill the cocktail shaker with ice then add the vodka, spinach juice, cucumber juice, lavender honey syrup and arugula bitters. Shake until chilled then strain into an ice filled glass, garnish and serve. 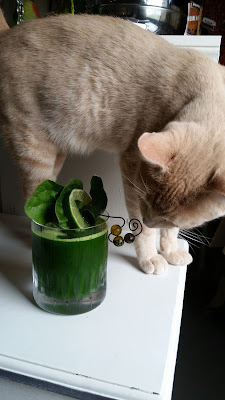 Tips: I didn't bother to clean the juicer after doing the spinach because I wanted all that green color. Besides the two juices were going to be mixed together in a few seconds anyway. I live out in the country so I take the pulp from the juicer that's left over and I feed it to the bunnies outside. They love it.